Zombie Raid on McPherson Square! Zombies are the new pirates, and we, for one, welcome our new zombie overlords. OK, so they're not real zombies. (Are you shocked?) We know, sometimes it seems like zombies are wandering around downtown, but we assure you that they're usually just lawyers or politicians. Urban Prankster is planning a flash mob (a large group that gathers suddenly, does something weird and then disperses without comment) this Saturday at McPherson Square (1400 I St. N.W.). And yeah, it's a zombie raid! 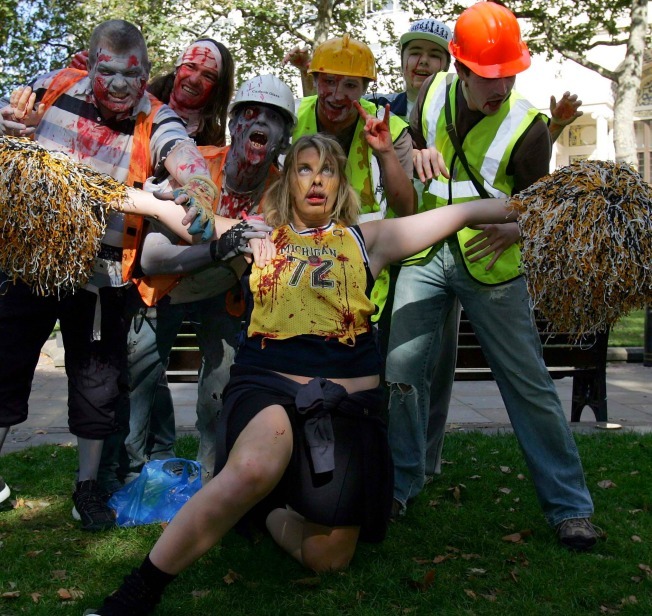 People will dress as zombies, but "not to the point where we can't just look like casual people," say the planners. They're meeting at the McPherson Square Metro Saturday at 4:30 p.m. If you're ready to have your brains eaten (who isn't?! ), visit the ZOMBIE RAID!! Facebook page. Update 1: Makeup is optional. We want a few of the starting zombies to have makeup but we also need some people that will start out normal and then be "bitten". COSTUMES, not makeup, will be the big thing here. Update 2: We are removing the biting part because of panic issues. We feel that the bystanders seeing people being "bitten" will cause too much panic and compromise safety. Yes, it seems that they're worried people will actually think zombies are on the loose. Although judging from some of the e-mails we get these days, we can understand why that could be a concern. After assembly, the group will spontaneously decide whether to start a zombie walk down 13th Street N.W. or board the Metro and split into two groups, who will get out at Metro Center and Chinatown and converge downtown "in a zombie-walking way." The Big Scary Spontaneous Group of Zombies (augh!) will visit typical tourist locations such as the National Portrait Gallery, the International Spy Museum and the Museum of Crime and Punishment and then head to the Archives Metro stop for part two of their diabolical plan. Part 2: We take Metro from Archives to Dupont Circle, acting like there is nothing weird about our costumes. The zombies will do their zombie thang around the Dupont fountain and up New Hampshire Avenue N.W. to U Street N.W. Of course, no event -- or zombie raid -- is complete without an after-party. This one's at at EXPO (1928 9th St. N.W. ), featuring music acts Chainsaw Baby, 23 Rainy Days and Violet Says 5, plus DJs spinning all night. Anyone in zombie gear/makeup gets free entry; it's $10 for boring ol' non-zombies. We feel like we shouldn't have to say this, but the after-party is 21 and up. RSVP here. The after-party runs from 9 p.m. to 3 a.m.